Who’s really pushing ‘bad science’? What do creationists really teach? How important is evolution to science, really? What really happened in Kansas? Lawrence Lerner is a Skeptic and a retired professor of condensed matter physics. His recent report, supposedly on US State science teaching, has grabbed news headlines for its grades of all 50 state curricula. One would think that an assessment of ‘good science’ and ‘bad science’ would assess real science like physics, chemistry, experimental biology, etc., on how effectively their important concepts were learnt by the student. But no, these ‘science teaching’ grades are based solely on how favourably each state deals with biological evolution in the curriculum guide. Ten states scored ‘A’, meaning (in Lerner’s opinion) ‘Treatment of evolution is very good or excellent’; the grades drop as evolution is treated less dogmatically, while one state (Kansas) received an ‘F-’ for allegedly ‘removing all references to biological evolution’. As documented below, Lerner’s report contains much in the way of rhetoric and logical fallacies and little of real science of the type that put men on the moon, cures diseases, etc. It is vitally important that words should be used accurately and consistently. Without this, any discussion is meaningless, so this must be addressed before anything else. And this is a major failing with Lerner’s paper — he never defines ‘evolution’ and he doesn’t use the term consistently. ‘What do we mean by evolution, and what is its place in the sciences? The universe is a dynamic place at every scale of space and time. Almost all science is the study of the evolution of one system or another — systems as large as the universe itself or as small as a neutrino; systems whose time scales are measured in billions of years or in attoseconds. Offspring are similar to but not exactly like their parents. Offspring have to grow up (or change; e.g., metamorphose) before reproducing themselves. Natural selection determines the differential survival of groups of organisms. But understanding these concepts does not depend on the GTE. What is the real problem with evolution? The main scientific objection to the GTE is not that changes occur through time, and neither is it about the size of the change (so we would discourage use of the terms micro- and macro-evolution). The key issue is the type of change required — to change microbes into men requires changes that increase the genetic information content, from over half a million DNA ‘letters’ of even the ‘simplest’ self-reproducing organism to three billion ‘letters’ (stored in each human cell nucleus). Nothing in Lerner’s paper (or anywhere else) provides a single example of functional new information being added. To claim that mere change proves information-increasing change can occur is like saying that because a merchant sells goods, he can sell them for a profit. The origin of information is a major problem for the GTE — see the articles Beetle Bloopers, Is there really a God? How would you answer?, and Information: A modern scientific design argument. Equivocation must be exposed for what it is. Once ‘bait-and-switch’ tactics by evolutionists are exposed, most of their ‘scientific’ case for the GTE collapses. But CMI does not deny speciation — in fact, it is an important part of creationist biology — see Q&A: Speciation. Creationists, starting from the Bible, believe that God created different kinds of organisms, which reproduced ‘after their kinds’ (Gen. 1:11, 12, 21, 24, 25). Thus the biblical kinds would have originally been distinct biological species, i.e. a population of organisms that can interbreed to produce fertile offspring, but that cannot so breed with a different biological species. But creationists point out that the kind is larger than one of today’s ‘species’. This is because each of the original kinds was created with a vast amount of information. There was enough variety in the information in the original creatures so their descendants could adapt to a wide variety of environments. But again, it’s important to stress that speciation has nothing to do with real evolution (GTE), because it involves sorting and loss of genetic information, rather than new information. But this is fallacious. Creationists have pointed out that as long as two creatures can hybridize with true fertilization, the two creatures are the same kind.3 Also, if two creatures can hybridize with the same third creature, they are all members of the same kind.4,5 Any problems with ‘the breadth of a kind’ are actually due to inconsistencies in the man-made classification system, not the term ‘kind’. That is, organisms classified as different ‘species’, and even different genera or higher groupings, can produce fertile offspring. This means that they are really the same species that has several varieties, hence a polytypic (many types) species. A number of examples are presented in Ref. 3, and in the article Ligers and wholphins? What next?, including Kekaimalu the wholphin, a fertile hybrid of two different so-called genera. Some atheistic skeptics have demanded that creationists should list every single ‘kind’. Of course, to even begin to do so, it would be necessary to perform hybridization experiments on all sexually reproducing organisms, so this is unreasonable. And no evolutionist has ever listed all biological species anyway, as opposed to a list of organisms classified into arbitrary man-made groupings classified as species. And the skeptic’s demand for a list of every single kind overlooks the fact that a denotative definition (i.e. exhaustive list) is not the only kind of definition. The hybridization criterion is a more reasonable operational definition, which could in principle enable researchers to list all the kinds. As shown above, the creationist concept of kind has nothing to do with trying to fit things on the Ark, but based on sound biblical exegesis and the concept of hybridisation. In reality, the converse is true — sceptics hate the creationist analysis of ‘kinds’ partly because it neutralizes sceptical attacks on the Ark that try to pack it full of millions of ‘species’, including many which are marine, invertebrate or plant anyway, so could have survived off the Ark. See How did all the animals fit on Noah’s Ark? One sad thing is seeing self-professed Christian apologists like Hugh Ross parrot these atheistic attacks on a global Flood and Ark, and resorting to the long-disproven notion of fixity of species to maintain his old-earth compromise — see Exposé of Hugh Ross book: The Genesis Question. Lerner claims that evolution occupies a ‘central place’ and has a ‘unifying role’ in the life sciences, and the title even hints that the physical sciences are affected. However, as shown above, since he has not defined ‘evolution’ properly, the claim is unsound. Certainly, it is important (and trivially obvious) that things change, but what exactly would be lost from real science if the GTE were disbelieved? Was it really necessary for me to believe that microbes changed into mice, magnolias and man to perform research on vibrational spectroscopy and superconductivity? I challenge Lerner to similarly name a single discovery in his own speciality of the physics of condensed matter (i.e. matter that is not gaseous — solids and liquids) that had the slightest thing to do with believing that particles changed into people without any intelligent guidance. See also Is evolution really necessary for medical advances? This is a blatantly false claim, not just a matter of opinion or interpretation. Many key aspects in biology (as well as the other major branches of modern science) were discovered by creationists! For example, Louis Pasteur discovered that many diseases were caused by germs and showed that life comes only from life, Gregor Mendel discovered genetics, and Carolus Linnaeus developed the modern classification system. And even today, many scientists, including biologists, contribute greatly to their field despite believing in biblical creation and disbelieving the GTE. See Creationist Biographies. Also, people whom Lerner praises for their contribution to astronomy — Copernicus, Kepler, Galileo and Newton — were also young-earth creationists, but he doesn’t inform his readers of this! Many historians, of a wide number of religious persuasions from Christians to atheists, point out that the basis of modern science depends on the assumption that the universe was made by a rational Creator. An orderly universe makes perfect sense only if it were made by an orderly Creator. But if atheism or polytheism were true, then there is no way to deduce from these belief systems that the universe is (or should be) orderly. Genesis 1:28 gives us permission to investigate creation, unlike say animism or pantheism that teaches that the creation itself is divine. And since God is sovereign, He was free to create as He pleased. So where the Bible is silent, the only way to find out how His creation works is to experiment, not rely on man-made philosophies as did the ancient Greeks. Note that creationists regard ‘natural laws’ as descriptions of the way God upholds His creation in a regular and repeatable way (Colossians 1:15–17), while miracles are God’s way of upholding his creation in a special way for special reasons. Because creation finished at the end of Day 6 (Genesis 2:1–3), creationists following the Bible would expect that God has since mostly worked through ‘natural laws’ except where He has revealed in the Bible that He used a miracle. And since ‘natural laws’ are descriptive, they cannot prescribe what cannot happen, so i.e. they cannot rule out miracles. Scientific laws do not cause or forbid anything any more than the outline of a map causes the shape of the coastline. See Creationist Scientists: Introduction and disclaimer. The current version, Humanist Manifesto 2000, was signed by the prominent evolutionary propagandists Richard Dawkins, E.O. Wilson, Richard Leakey, Molleen Matsumara and Daniel Dennett. The answer is in the next section. Religion and science deal with totally different areas? The atheistic Marxist evolutionist Stephen Jay Gould has claimed that religion and science are ‘non-overlapping magisteria’ (NOMA). That is, science deals with facts of the real world, while religion deals with ethics, values, morals, and what it means to be human. He expounded this thesis in his book Rocks of Ages: Science and Religion in the Fullness of Life (Ballantyne, NY, 1999). However, this is based on the philosophically fallacious fact-value distinction, and is really an anti-Christian claim. For example, the Resurrection of Christ is an essential part of the Christian faith (1 Corinthians 15:12–19), but it is also a matter of history, it passed the ‘testable’ claim that the tomb would be empty on the third day, and impinges on science because it demonstrated the power of God over so-called ‘natural laws’ that dead bodies decay. Christians must realise that this is not only a theoretical argument about the anti-Christian nature of NOMA, but also a practical one — Gould dismisses John’s historical narrative of Jesus’ post-Resurrection appearance to doubting Thomas as a ‘moral tale’ [Rocks of Ages, p. 14]. This NOMA distinction really teaches that religion is just in one’s head, which seems to dull the senses of many Christians more than an overt declaration that Christianity is false. So this is even more dangerous. No one is really neutral. Jesus said: ‘He who is not with me is against me, and he who does not gather with me scatters’ (Matthew 12:29). So it is with the teaching of evolution in State Schools. Teaching that God had nothing to do with the formation of life is an active statement against God and biblical Christianity, especially passages teaching that ‘fear of the Lord is the beginning of wisdom/knowledge ’ (Proverbs 1:7, 9:10). Lerner et al. realize that overt atheism would repel many Americans, so they are careful to advocate books by theistic evolutionists. However, this is reminiscent of Lenin’s tactic of cultivating ‘useful idiots’ in the West, who were too gullible to realize that they were undermining their own foundations. And the ones he cites, by John Haught and Kenneth Miller, present a ‘god’ nothing like the true God who reveals Himself in the Bible. It just goes to show that whenever the Bible and evolution are mixed, it’s always the Bible that is distorted. See The Skeptics and their Churchian Allies. To see why evolution / billions of years is incompatible with the God of the Bible, see Q&A: Genesis. Lerner and others claim scientists must practise methodological naturalism, i.e. that natural causes are the only ones allowed, and God, if He exists, did nothing that can be investigated (contrary to Romans 1:18–23). They claim that doesn’t necessarily imply ontological naturalism, i.e. that nature is all that really does exist, and God doesn’t. However, the converse is definitely valid, which is one reason it is promoted by so many atheists — atheists must believe that nature is all there is. 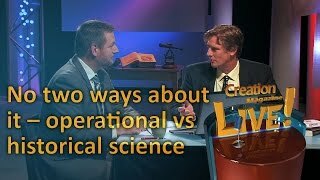 This fails to note the distinction between normal (operational) science, and origins or historical science.10 Normal (operational) science deals only with repeatable observable processes in the present, while origins science helps us to make educated guesses about origins in the past. And in my days as a university teaching assistant before joining CMI, I marked an examination answer wrong because it said ‘God made it so’ for a question about the frequency of infrared spectral lines, instead of discussing atomic masses and force constants. So Lerner is wrong that creationists are in any way hindered in real operational science research, either in theory or in practice. In contrast, evolution is a speculation about the unobservable and unrepeatable past. Thus it comes under origins science. Rather than observation, origins science uses the principles of causality (everything that has a beginning has a cause11) and analogy (e.g. we observe that intelligence is needed to generate complex coded information in the present, so we can reasonably assume the same for the past). And because there was no material intelligent designer for life, it is legitimate to invoke a non-material designer for life. Creationists invoke the miraculous only for origins science, and as shown, this does not mean they will invoke it for operational science. However, we can observe the motion of the planets, but no-one has ever observed an information-increasing change of one type of organism to another. To explain further: the laws that govern the operation of a computer are not those that made the computer in the first place. Lerner’s anti-creationist propaganda is like saying that if we concede that a computer had an intelligent designer, then we might not analyse a computer’s workings in terms of natural laws of electron motion through semiconductors, and might think there are little intelligent beings pushing electrons around instead. Similarly, believing that the genetic code was originally designed does not preclude us from believing that it works entirely by the laws of chemistry involving DNA, RNA, proteins, etc. Conversely, the fact that the coding machinery works according to reproducible laws of chemistry does not prove that the laws of chemistry were sufficient to build such a system from a primordial soup. For more information about difficulties with the origin of life from non-life, see Q&A: Origin of Life. A strong case can be made that dogmatic belief in evolution has harmed science, but Lerner downplays and even ignores this. Teaching discredited evolutionary ‘proofs’ is OK?! Many textbooks mislead students by teaching discredited ideas. For example, many teach that embryonic development parallels its alleged evolutionary history, also called embryonic recapitulation or ‘ontogeny recapitulates phylogeny’, which was based on forged diagrams of embryos by the 19th century proto-Nazi Darwinist Ernst Haeckel — see Ernst Haeckel: Evangelist for Evolution and Apostle of Deceit. Some textbooks don’t go this far, but still teach that embryonic similarity is proof of evolution, although the pictures used are also based on other forged drawings by Haeckel — see Embryonic Fraud Rediscovered. Another favourite ‘evidence’ for evolution is photos of peppered moths differentially camouflaged on tree trunks, although the moths never actually rest there and the photos were faked — see Goodbye, peppered moths and The Moth Files. Evidently what Lerner called ‘slipshod treatment of biological evolution’ doesn’t include presenting fallacious arguments for it! This should not be surprising, since as shown, evolution is really a pseudo-scientific justification for materialism, regardless of whether the facts support it! It was once popular to claim that evolution was proved by over 180 useless ‘vestigial’ organs in the human body alone. However, the evolutionary assumption that an organ was ‘useless’ hindered research to find out the functions. Now, this list of 180 has shrunk to zero — see Do any vestigial organs exist in humans?, Are wisdom teeth (third molars) vestiges of human evolution?, Your appendix … it’s there for a reason, The human vermiform appendix and Useless horse body parts? No way! A version of this argument is the claim that there is ‘junk DNA’ which again discourages research on possible functions, for which there is much evidence (see DNA: marvellous messages or mostly mess?). Note: creationists do not deny that there are some true vestigial organs in other species, but this is the result of degeneration, i.e. loss of information, so is the opposite type of change required for goo-to-you evolution — see New eyes for blind cave fish? First, we see the usual ‘poisoning of the well’ tactic of contrasting ‘creationists’ with some type of ‘scientists’, although as shown, there are thousands of creationists who are qualified practising scientists, including anthropologists, as shown earlier. Second, this is a smoke screen — it doesn’t matter who discovered it, because it was promoted ardently at least till 1930, and not exposed as a fraud till much later! Third, the fraud wasn’t even that good — there were obvious marks of filing and deliberate staining of some pieces with iron and chromium compounds to make them look old. A scientist working from a creationist framework would have suspected that there was something wrong, and exposed the fraud quickly, instead of after 40 years! We saw similar jumping on the bandwagon with the ‘life from Mars’ allegedly found in a meteorite in Antarctica. All around the world, the media proclaimed this as fact and forecast the demise of biblical Christianity. In Australia, a former Humanist of the Year and leading light in the Australian Skeptics gloated over this ‘find’ and used this to bash creationists in the Skeptic magazine and secular media. However, creationists demonstrated true skepticism right from the start (see Life on Mars? Separating fact from fiction ). 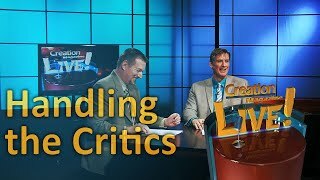 This creationist skepticism of anti-biblical conclusions that go way beyond the evidence has been vindicated (see for example Conclusive evidence for life from Mars? ), while those calling themselves ‘skeptics’ have again been shown to be gullible by uncritically accepting anything they can use to attack the Bible. More recently, National Geographic trumpeted a fossil called Archaeoraptor liaoningensis as proof that ‘We can now say that birds are theropods just as confidently as we say that humans are mammals.’ However, this turned out to be a ‘Piltdown bird’ combined from the body and head of a bird-like creature and the tail of a different dinosaur — see Archaeoraptor — Phony ‘feathered’ fossil, New four-winged feathered dinosaur? and Yet another flap about dino-to-bird evolution. For example, when learning chemistry, one important aspect was atomic theory. First we were taught about Thompson’s ‘plum-pudding’ model, followed by Rutherford’s ‘solar system’ model and Bohr’s model of quantized orbits — and learning problems with all these models. Then we were taught about atomic orbitals, which solved all the problems and was refined with experimental data. In contrast, Lerner and other anti-creationists believe that evolution should be exempt from the normal methods of sound teaching. It seems that he doesn’t share Todd’s and Kerkut’s confidence that evolution is strong enough to withstand teaching about its problems (and I agree with Lerner!). And if students question, then they might actually become sceptical of the underlying materialistic philosophy, and would be unable to become ‘intellectually fulfilled atheists’. Instead, Lerner prefers that students are taught discredited evidence for evolution, so they may keep the faith at all costs. For a report lamenting poor quality science, Lerner’s report is chock-full of faulty science itself. And this is not merely just a question of a materialistic interpretation of the data, but actually presenting wrong data and ignoring others. By whose definition? As explained, creationists do not deny speciation, since here also there is no new information. In fact, we would be happy for speciation to be as fast as claimed here, because it demolishes the claim that there would be too little time for variation after animals disembarked from the Ark — see Darwin’s Finches: Evidence supporting rapid post-Flood adaptation and The birds of the Galápagos. However, another problem with using these finches is that the variation seems to be cyclic — while a drought resulted in a slight increase in beak size, the change was reversed when the rains returned. So it looks more like built-in adaptability to various climatic conditions than anything to do with the GTE — see discussion by Jonathan Wells. However, this horse ‘series’ is constructed from a rock badger on the bottom, while the rest comprises nothing but different varieties of horses, little different in many respects from the range of sizes, toe number, etc. seen in horses living today. See The Non-evolution of the horse . It is inexcusable for a condensed matter physicist to claim that a very modest shift in wavelength response will transform an infrared-sensitive spot to a light sensitive spot, because the responses are completely different. Infrared rays cause transitions in molecular vibrational quantum states, which is why it is ‘heat radiation’. Visible light causes transitions in electronic quantum states. His descriptions of ‘light sensitive spots’, ‘pit’, subcutaneous nerves, etc. sound simple, but they are really biochemically very complex. See At the bottom of Mount Improbable? Eye evolution, a case study for a detailed refutation of Dawkins’ far more sophisticated argument for eye evolution. This is merely parroted from the likes of the atheist Richard Dawkins and Kenneth Miller, a modernist Roman Catholic who has a long history of teaming up with leading humanists against biblical creation (and who fails to explain adequately why ‘bad design’ doesn’t argue equally against ‘God used evolution’ and ‘God designed directly’). And this is not really an argument for evolution per se at all — because they present no step-by-step way for the structure to have evolved — but it is purely an attack on a designer. So much for Lerner’s claim that he is not trying to ‘attack religion’. Darwin also used this tactic frequently. It’s also ironic that such argumentation tacitly concedes the creationist claim that creation and evolution are the only two possibilities — most evolutionists airily dismiss this claim when it suits them. However, it would be nice if anti-creationists actually learnt something about the eye before making such claims, or even showed that the eye didn’t function properly as a result. In fact, any engineer who designed something remotely as good as the eye would probably win a Nobel Prize! If Lerner or his mentors disagree, then I challenge them to design a better eye with all the versatility of the vertebrate eye (colour perception, resolution, coping with range of light intensity, night vision as well as day vision, etc.)! And this must be done under the constraints of embryonic development. The retina can detect a single photon of light, and it’s impossible to improve on this sensitivity! More than that, it has a dynamic range of 10 billion (1010) to one; that is, it will still work well in an intensity of 10 billion photons. Modern photographic film has an dynamic range of only 1000 to one. Even specialist equipment hasn’t anywhere near the dynamic range of the eye, and I have considerable experience in state-of-the-art supersensitive photomultipliers. My Ph.D. thesis and published papers in secular journals largely involve a technique called Raman spectroscopy, which analyses extremely weak scattering at a slightly different frequency from that of the incident laser radiation. The major equipment hazard for Raman spectroscopists is scanning at the incident frequency — the still weak Rayleigh scattering at the same frequency would blow the photomultiplier (the newer ones have an automatic shut-off). I managed to safely scan the Rayleigh line (for calibration) only by using filters to attenuate the intensity of light entering the photomultiplier by a factor of 10–7–10–8. But having to take such an extreme safety precaution made me envious and admiring of the way the eye is so brilliantly designed to cope with a far wider range of intensities. Another amazing design feature of the retina is the signal processing that occurs even before the information is transmitted to the brain. For example, a process called edge extraction enhances the recognition of edges of objects. Dr John Stevens, an associate professor of physiology and biomedical engineering, pointed out that it would take ‘a minimum of a hundred years of Cray [supercomputer] time to simulate what takes place in your eye many times each second.’ [Byte, April 1985]. And the retina’s analog computing needs far less power than the digital supercomputers and is elegant in its simplicity. Once again, the eye outstrips any human technology, this time in another area. He explained that the nerves could not go behind the eye, because that space is reserved for the choroid, which provides the rich blood supply needed for the very metabolically active retinal pigment epithelium (RPE). This is necessary to regenerate the photoreceptors, and to absorb excess heat. So it is necessary for the nerves to go in front instead. This doesn’t spoil vision, because the nerves are virtually transparent because of their small size and also having about the same refractive index as the surrounding vitreous humour. In fact, what limits the eye’s resolution is the diffraction of light waves at the pupil (proportional to the wavelength and inversely proportional to the pupil’s size), so alleged improvements of the retina would make no difference. The choroid in front of the retina — but the choroid is opaque because of all the red blood cells, so this design would be as useless as an eye with a hemorrhage! Photoreceptors not in contact with the RPE and choroid at all — but then it would probably take months before we could drive after we were photographed with a flashbulb. As for the claim that the octopus eye is somehow ‘right’, again it seems that Lerner and his mentors never bothered to study this eye. In fact, octopi don’t see as well as humans, and the octopus eye structure is totally different and much simpler. It’s more like ‘a compound eye with a single lens’. See also the detailed response by the ophthalmologist Peter Gurney to the question Is the inverted retina really ‘bad design’? Certainly creationists do ultimately attribute natural evils, including death, to Adam’s sin, based on Genesis 3:19 and Romans 8:20–22. But the Bible teaches that people are responsible for their own sinful actions, and that sin (disobedience to the Creator) is the root of all the evils in the first paragraph. If God made us, then He owns us, and has the right to make the rules for us — and because He made us, He knows what’s best for us. And — this is most important of all — we are accountable to Him, worthy of infinite punishment for violating His infinite holiness, and have only one way out, This is to believe that Jesus Christ, fully God and fully man, bore the punishment we deserve. But if no-one made us, then rules are simply conventions from culture or have evolved for survival value, and there is no objective basis for deciding right and wrong. And ultimately we are accountable to no-one but ourselves. For example, Humanist Manifesto II (1973) states: ‘Ethics is autonomous and situational …’ (emphasis in original). But evolution is a pseudo-intellectual rationalisation for those who want to avoid the idea that they are accountable to their Creator, so they can thus live their lives as they please. And it’s not just creationists who think so — see Morals decline linked to belief in evolution and the articles hyperlinked at the bottom. In fact, this is the whole basis of Daniel Dennett’s book Darwin’s Dangerous Idea (see review), an overtly anti-Christian book advocated by many pro-evolutionists, even those who claim they are not anti-God. It happens to be a fact that Communism and Nazism were evolution-based systems of government (see Q&A: Communism and Nazism), and abortion and euthanasia have also been promoted by anti-Christian evolutionists15 (see also Q&A: Human Life — Abortion and Euthanasia). Abortion could be rationalized by ‘If you can get rid of spare cats, then why not get rid of spare kids?’, and abortionists often claim that the human embryo is just going through a ‘fish stage’, using those forged embryo diagrams by Haeckel. And the kids who shot their classmates at Columbine High School wore T-shirts with ‘Natural Selection’ (see How to build a bomb — in the Public School System and the further response and explanation Bomb-building vs. the biblical foundation), and seemed to target the Christians — a secret well kept by the humanist-dominated media. If humans are really just rearranged pond scum — the results of survival of the fittest — then what could possibly be the basis for saying that the Columbine killers did wrong? It is a logical fallacy (called the Naturalistic Fallacy) to derive moral codes from science. Morality tells us what people ought to do, while science can at best only tell what people actually do. Science may indicate that if a 20 kg weight is dropped from a height of 100 metres on someone’s head, it would probably kill him; morality is determined by our Creator who declares that murder (intentional killing of innocent humans) is wrong. Lerner accuses Kansas of ‘removing all references to biological evolution’. This accusation was often repeated in the media as well. But either Lerner and the journalists were too lazy to read the new Kansas standards, or they are prepared to tell outright lies to further their cause. In fact, the standards actually covered evolution five times as much as the old ones. Students would have been required to learn about Darwin’s theory of natural selection, and many of the other concepts that Lerner deemed were important. But what really irked the critics was that the standards refused to go beyond the evidence, i.e. they refused to say that mutations + natural selection could account for all life on the earth, without an intelligent designer. This shows that the critics were more concerned with materialist indoctrination than real science. Despite Lerner’s claim that his study was not meant to be anti-God, he recommends the Richard Dawkins book The Blind Watchmaker.17 The whole point of this is explained in the subtitle — to try to justify atheism by finding an alternative to an intelligent designer for life. Lerner also recommends Arthur Strahler’s book Science and Earth History: The Evolution/Creation Controversy, published by the Humanist publisher Prometheus Books, Buffalo, NY, 1987. The token creationist book is Morris, Henry M. and John C. Whitcomb, Jr., The Genesis Flood: The Biblical Record and Its Scientific Implications. This was a very fine book in its day (1961) and certainly a major catalyst for the modern creationist movement. Most of its biblical analysis has not been superseded, and even a lot of its science is still sound, although there are a number of parts that are out of date. Amazingly, Lerner recommends the National Academy of Sciences guidebook, Teaching About Evolution and the Nature Of Science, although my book Refuting Evolution (right) showed that the NAS guidebook was motivated by anti-Christian bias and contained many errors in fact and logic. Lerner also recommends Pennock, Robert T., Tower of Babel: The Evidence Against the New Creationism, MIT Press, Cambridge, MA, 1999, as supposedly a good refutation of creationism and intelligent design. The atheist Eugenie Scott, leader of the so-called National Center for Science Education (a humanist-founded-and-operated organisation which does nothing but push evolution and bash creation) praised it to the skies in Scientific American, August, 1999 — see a creationist response to Scott’s review. And Journal of Creation 14(2), 2000 contains a detailed rebuttal of Pennock’s book by Allan Steel, refuting a number of the same errors made by Lerner — perhaps this book is a major source of Lerner’s lapses. In the same issue of the Journal, Allan Steel shows how languages have developed over time, and shows that The development of languages is nothing like biological evolution—this undermines Pennock’s chief case, and demonstrates his abysmal ignorance of the topic. Lerner’s ‘report’ on teaching ‘science’ is really a work of advocacy of teaching ‘goo-to-you-via-the-zoo’ evolution. Because this is essential for atheism, it must be taught at all costs, even if it means using discredited evidence. Lerner’s work also displays a deliberate fudging of meanings about the word ‘evolution’ and misrepresents what creationists actually teach. And he fails to demonstrate that evolution is essential for science, and he refuses to acknowledge the creationist basis for modern science itself, as well as the continuing contributions by creationists. Kerkut, G.A., Implications of Evolution, Pergamon, Oxford, UK, p. 157, 1960. He continued: ‘the evidence which supports this is not sufficiently strong to allow us to consider it as anything more than a working hypothesis.’ Return to text. Wieland, C., Variation, information and the created kind, Journal of Creation 5(1):42–47, 1991. Return to text. Marsh, F.L., Variation and Fixity in Nature, Pacific Press, Mountain View, CA, USA, p. 37, 1976. Return to text. The implication is one-way — hybridization is evidence that they are the same kind, but it does not necessarily follow that if hybridization cannot occur then they are not members of the same kind (failure to hybridize could be due to degenerative mutations). Return to text. Dawkins, R., The Blind Watchmaker: Why the evidence of evolution reveals a universe without design, W.W. Norton, NY, 1986, p. 6. Return to text. Todd, S.C., correspondence to Nature 401(6752):423, 30 Sept. 1999. Return to text. baskeptics.org/about/policies, 28 September 2000. Return to text. Johnson, P.E., The Wedge of Truth: Splitting the Foundations of Naturalism, InterVarsity Press, Illinois, 2000; review by Truman R., CEN Technical Journal 14(3), 2000, in press. Return to text. Thaxton, C.B., Bradley, W.L. and Olsen, R.L., The Mystery of Life’s Origin, pp. 200–217, Philosophical Library Inc., New York, 1984. Return to text. Sarfati, J.D., If God created the universe, then who created God? Journal of Creation 12(1)20–22, 1998. Return to text. Todd, Ref. 7. Return to text. Kerkut, Ref. 1, pp. 3–5. Return to text. Kerkut, Ref. 1, p. 175. Return to text. For example, Humanist Manifesto II (1973) states: ‘The right to birth control, abortion, and divorce should be recognized.’ Its signatories include Alan Guttmacher of Planned Parenthood, Betty Friedan of the National Organisation of Women — both leading pro-abortion organizations — and Henry Morgentaler who was at the forefront of the Canadian push for abortions. Etienne Baulieu, the developer of the abortion pill RU-486, properly known as a human pesticide, is a signatory to Humanist Manifesto 2000. And in New Zealand, where I lived most of my life, a major leader in liberalizing the abortion law was the abortionist Dr Woolnough, who was a member of the NZ Humanist Society. Peter Singer uses atheism to attack a sanctity-of-life ethic — not only for unborn babies, but also for newborn babies and elderly people with Alzheimer’s disease. Return to text. Bergman, J., The history of the teaching of human female inferiority in Darwinism, Journal of Creation 14(1):117–126, 2000. Return to text. Dawkins, Ref. 6. Return to text.